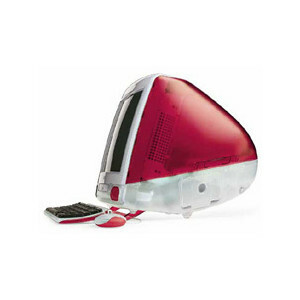 The iMac G3 computer was originally released in August 1998. You may come across one of these machines, or a similar vintage Mac computer at a garage sale or a friend's house, and want to try to restore the computer to original working order. Recently when I worked with one of these computers, it was running fine for several days, and then suddenly after being moved from one location to another, refused to power on or show any indication of life - no lights on the keyboard's power button, no noises when the power button was pressed. When I first began playing with it, and the computer was still working, I had noticed the clock gave a strange date and time. I attributed this to simply having been powered off and unused for a long period of time, and after setting the clock, ignored it. In trying to troubleshoot this problem by reading suggestions and information online, a few people referenced changing out the PRAM battery located inside the iMac for a new battery. Some people reported this was all they needed to get their iMac G3 computers running again, while other people stated that this would not work, and that a dead or dying PRAM battery would not prevent the computer from powering up. Allow me to confirm once and for all that in the absence of any other problem, a dead PRAM battery WILL INDEED prevent an iMac G3 computer (or similar model) from powering on. I changed that battery, and did nothing else, and the computer started right up on the first try. Supposedly these machines are vulnerable to power supply issues after several years, and that could also explain many of the dead iMacs that may be out there. However, you don't need a dead power supply to stop an iMac from powering on -- the PRAM battery can cause the same symptoms. I would encourage anyone restoring one of these machines to try replacing the PRAM battery first before moving on to diagnose the power supply or anything else inside an iMac G3. The PRAM battery is relatively easy to reach, compared with the power supply or most other components inside this machine.